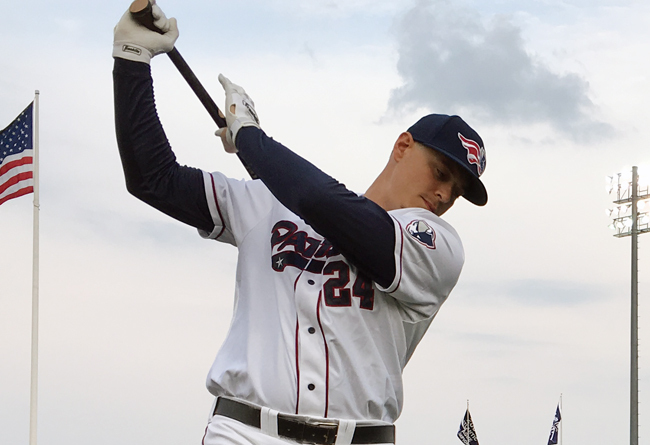 (Bridgewater, N.J., Jan. 25, 2017) – The Somerset Patriots have announced the re-signing of first baseman and 2012 Major League All-Star Bryan LaHair. LaHair enters his second season with the Somerset Patriots and second in the Atlantic League. In his first year as a Patriot, the 6’5” infielder hit .279 and finished second in the league in RBI (86). He also led the team in doubles (24) and games played (123), finished second in at-bats (476) and third in home runs (10) and hits (133). Additionally, LaHair was selected to the 2016 Atlantic League All-Star Game, where he went 2-for-4 with a double. The Worcester, Massachusetts native has three years of Major League service, including two with the Chicago Cubs in 2011 and 2012. LaHair earned a spot as a reserve infielder in the 2012 MLB All-Star game after a strong start to begin the season with the Cubs. That year, he hit .390 with five home runs and 14 RBI in April, and carried those strong stats through May, still holding a .308 average with 10 home runs and 22 RBI come the beginning of June. LaHair had one at-bat in the All-Star Game in front of over 40,000 fans at Kauffman Stadium in Kansas City, Missouri. Overall, he hit .259 with 16 home runs, 40 RBI and 17 doubles over 130 games that season with the Cubs. The St. Petersburg College alum has hit over 20 home runs in four different minor league seasons, highlighted by a league-leading 2011 campaign with the Triple-A Iowa Cubs. That year, LaHair led the Pacific Coast League in home runs (38) and RBI (109) with a .331 average. 2015 Somerset Patriot Mat Gamel finished second in homers in the PCL that year with 28. LaHair split time between Double-A Akron and Triple-A Columbus in the Cleveland Indians organization in 2014, and spent time with the Boston Red Sox during Spring Training in 2015. Overall, LaHair has batted .287 with 174 home runs and 801 RBI in 1,204 games in the minors.